Autodesk Revit Achitecture is a powerful software for Building Information Modeling (BIM). Revit’s parametric technology allows changes anywhere in your design to be reflected and updated in the whole project. Learn the skills of employing Revit to facilitate the design process and automate documentation. By the end of the course you will have a good understanding of BIM and be able to implement ideas from concepts to construction with a coordinated and consistent model-based approach. You will also familiarize yourself with powerful tools specifically built to support BIM workflows. 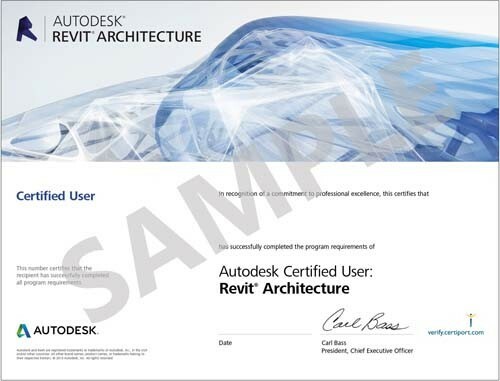 Certify your BIM skills with Autodesk Revit Architecture Professional certification. The certification is not a requirement for course completion but we highly recommend you to get your skills professionally recognized. Remark: The course fee does not include the certification exam. After completing this course you can further develop your BIM knowledge and skills in BIM technologies with the course Advanced Certificate in Revit MEP. *after maximum 80% fee reimbursement from CEF. Full course fee is $7800, payable by monthly instalments. Am I eligible for CEF subsidy? Course participants should be at least 18 years old and have an education level of Form 5 or above. They should also be computer-literate with a sound knowledge of the Windows operating systems and have a basic understanding of building design. Previous knowledge of AutoCAD would be an advantage as it may help understand a number of software features, but it is not compulsory. The courseware is offered in both imperial and metric versions with hands-on exercises representing real-world design scenarios. Students are required to complete and pass an assignment. Upon successful completion of the course, students will receive a certificate for the course. Application should be submitted before the course commences. You are qualified to enjoy max $10, 000 course fee reimbursement from HK government. Our officers are glad to assist your application when you enroll this course. You will pay the course fee ($7,800) by instalments unless your course finishes within one calendar month. The number of instalments is the number of calendar months that your course spans. At enrolment, you are required to pay only the first instalment, the amount of which is shown next to the “Enrol” button. Sign up for your course by clicking the “Enrol” button, then proceed to checkout to finish course registration. The Revit platform is Autodesk’s purpose-built solution for building information modeling (BIM), which is changing the way how architects and engineers create and manage their designs. With Revit’s parametric design engine, a dynamic 3D model is generated to replace a whole series of traditional CAD drawings. BIM assembles all information into one location and cross-link data intelligently. A change in one view of the model will propagate to all other views of the same model to update related changes, allowing designers to have a much more effective way to create, control, and display information. BIM improves visualization, minimizes errors, save costs, and allows better predictability and planning. Proceed with on-line registration or send the completed enrolment form (download) to us together with a cheque (made payable to Welkin Compuer Training) for the program fee. CEF applicants have to complete the CEF Application Form (download) and send it to us for certification. They will then send the form to The Office of the Continuing Education Fund, Units 07-11, 25/F., CDW Building, 388 Castle Peak Road, Tsuen Wan, New Territories. Together with a photocopy of their HKID Card before course commencement. Applicants may also place their applications in the drop-in box on 12/F., Cheung Sha Wan Government Offices. ©2019. Welkin Systems Limited | All Rights Reserved.